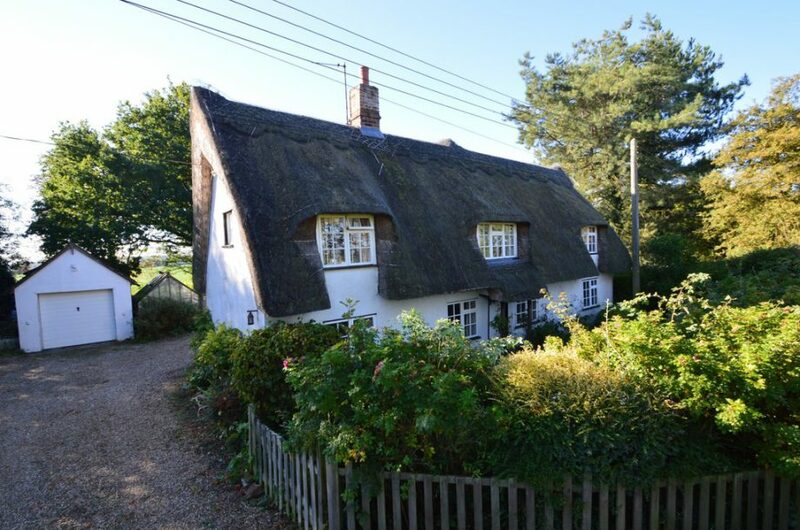 A charming unlisted thatched cottage in a delightful setting offering characterful accommodation with attractive period features and detail. The property would benefit from some updating or enlargement(stp) and has a range of useful outbuildings. In all about 0.80 acres sts. No onward chain. Hyde Cottage is a delightful unlisted detached property enjoying a glorious position on the periphery of this sought after North Essex village. The property offers characterful and charming family accommodation arranged over two floors and of note is the spacious reception hall which is housed in a more recent addition with stairs rising to the first floor. There are three principal reception rooms in the original part of the property with a sitting room having an impressive inglenook fireplace with inset wood burning stove and attractive exposed studwork to the walls and ceiling. A ledge and board door leads to a delightful study/snug which takes in views to the attractive front garden and has exposed stud work to the walls and ceilings. There are glazed French doors from the sitting room through to the dining room which is a charming room with a dual aspect and has French doors leading to a South facing terrace. This room has exposed framework to the ceilings and an original cooking range set within the fireplace. The kitchen/breakfast room is situated to the rear of the property and is housed within a newer extension and is fitted with a range of handmade elm units with a tiled floor and views to the garden and countryside beyond. A useful utility room houses the boiler and has a door to the rear garden and a cloakroom completes the ground floor accommodation. Attractive open tread stairs rise to the first floor with the principal bedroom being situated to the rear of the property within the aforementioned later addition. This room has a dual aspect and stunning views to the grounds and the rolling countryside in the distance. It is fitted with a range of bespoke wardrobes and cupboards. 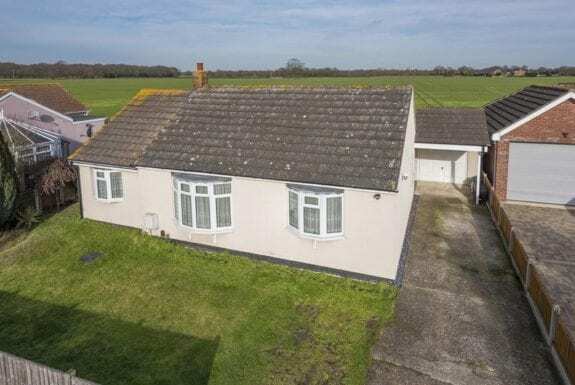 A delightful landing with large linen cupboard which could make study space if required and has views to the front elevation and across countryside beyond. Two ledge and board doors access charming bedrooms situated in the original part of the property with exposed studwork to the ceilings. The bedrooms are served by a family bathroom. The property is approached via a large gravelled drive which is flanked by expanses of lawn with a particularly attractive blue spruce providing a focal point. There is a detached single garage accessed via the drive which is segregated by fencing and trellis work with a wrought iron gate leading to the rear garden. There is a pretty front garden with densely stocked herbaceous borders and a mixed mature hedge. The rear gardens are an absolute delight and benefit from a South and Westerly aspect enabling them to take advantage of the afternoon and evening sun. There is an extensive terrace which is accessed via French doors from the dining room beyond which are large expanses of lawn interspersed with a variety of densely stocked herbaceous and shrub borders. The grounds have a vast array of specimen trees to include oak, silver birch, ash and willow. To the rear of the garage is a large studio building fully glazed to its apex allowing the occupants to take advantage of the stunning views and it is equipped with power and light which makes for a perfect home office if required. There is an additional outbuilding which is also equipped with power and light and has been used as an artist's studio in the past. The remainder of the grounds comprise further expanses of lawn with mature trees and a substantial garden storage shed. In all about 0.80 acres sts.